Mark D’Agostino is a managing partner of the Enterprise Group at the Brooklyn-based Blockchain conglomerate, ConsenSys. He will be presenting at Bitcoin Wednesday on 4 October 2017 with his colleagues, Karl Kreder and Igor Lilic. Mark is the lead for Energy consulting engagements at ConsenSys and in this role has worked closely with a number of utilities and global energy companies. He has recently decided to step back from his Enterprise activities to spend more time on product development and strategic leadership within ConsenSys. Before coming to ConsenSys, Mark spent ten years in management consulting for the financial services industry and helped establish Deloitte’s blockchain service offering. 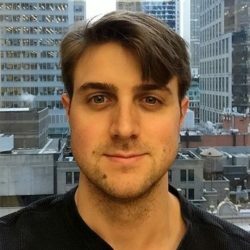 He has successfully delivered Ethereum-based applications for Fortune 500 banks, global energy companies and governments. Over his career he has served clients such as AIG, BlackRock, Citi, GE, JPM, Lehman Brothers, MasterCard and Pfizer. Mark D’Agostino is a managing partner of the Enterprise Group at the Brooklyn-based Blockchain conglomerate, ConsenSys. He is the lead for its Energy consulting engagements. Before coming to ConsenSys, Mark spent ten years in management consulting for the financial services industry and helped establish Deloitte’s blockchain service offering. He has successfully helped to deliver Ethereum-based applications for Fortune 500 banks, global energy companies and governments.